Nissan LEAF - Powered by Twitter? Nissan recently put their hat in the ring of energy-efficient vehicles with their announcement of the 100% electric, zero-emissions Nissan LEAF. (To be fair, they’ve had an Altima Hybrid since 2007 but the technology is licensed from Toyota). As is the case for many hybrid and electric vehicles, a key part of the message is centered around technology. In fact, it’s the technology that auto manufacturers are hedging their bets on. A quick read of Nissan’s initial press release for the LEAF yields tech phrases from “laminated compact lithium-ion batteries” to “exclusive advanced IT system”. One way to try and communicate that you're on the bleeding edge of technology is by engaging consumers through the latest popular communication channels. 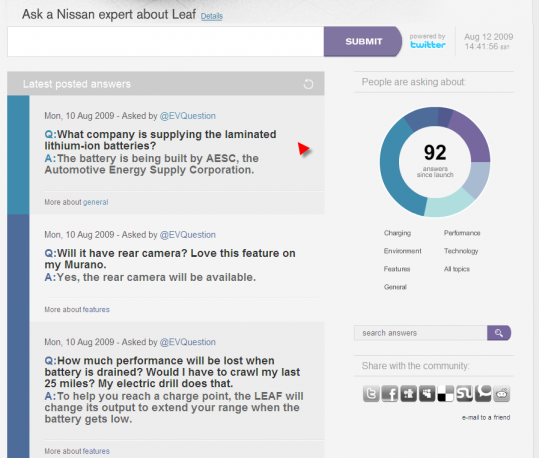 The LEAF micro-site prominently displays a form for visitors to submit questions to a Nissan expert along with an embedded Twitter feed of previously answered questions. The page claims it is “powered by Twitter” (which it is, I suppose) and even includes the Twitter logo. In many ways, this is a fresh approach and valiant attempt at integrating a popular social media tool within a micro-site. In other ways, it falls a bit short. Interactivity - The site solicits questions and, from what I can tell, answers relevant ones in a timely fashion. Fresh content - As new questions are asked, answered, and approved, content is created and pushed to the site. Share-ability - The site integrates sharing features of the most popular social media outlets. Lack of True Twitter Integration - While the question and answer functionality might be “powered by Twitter” it doesn’t take advantage of the service’s key benefits (quick content, interactivity, connection, transparency, and rapid response). As such, there is no real benefit to having the site “powered by Twitter”. Weak Connection - From what I can tell, when a question is answered and approved by Nissan it is posted to the micro-site and as a tweet from @NissanEVs to @EVQuestion. The problem is it doesn’t show up as a question from me (@dougkushin) on Twitter or the micro-site. This is a huge miss! Since Nissan never @replies me I would never know if and when my question has been answered unless I constantly check the micro-site or follow @NissanEVs. Nissan is missing an opportunity to connect with customers directly. Haphazard Background Design - @NissanEVs background of tiled Nissan logos leaves much to be desired. Nothing custom, nothing creative, nothing but tiled logos. Why not do something creative or useful like @chevyvoltage, @scottmonty, or @ford? Simplify - Create one definitive Twitter account. Open up - Display the full Twitter feed directly on the micro-site. Include all (relevant) questions submitted as @replies on the micro-site. Connect - Capture users Twitter handles from the micro-site and @reply them the answers directly. I applaud Nissan for taking a huge step in creating energy-efficient and environmentally friendlier cars and I welcome their desire to connect with consumers and address their questions openly. Yet, the current implementation has room for improvement. Judging by their responsiveness to date (see below), there's hope. (Note: To their credit @NissanEVs has already responded to Josh's tweet about some of the confusing ways they are executing the Twitter integration and has made positive tweaks to the micro-site).